For the Sega Mega Drive game, see Indiana Jones and the Last Crusade. 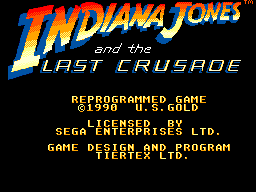 Indiana Jones and the Last Crusade is a video game based on the third Indiana Jones film, originally developed by Tiertex for U.S. Gold in 1989. It is often subtitled The Action Game to differentiate it from the Lucasfilm-developed graphic adventure adaptation released around the same time. Tiertex originally wrote this game for home computers, with releases for the Amiga, Amstrad CPC, Atari ST, Commodore 64, IBM PC and ZX Spectrum in 1989. In 1990 it was converted to the Sega Master System and in 1992, the Sega Game Gear. 1993 saw a Nintendo Entertainment System conversion and a Game Boy port arrived in 1994. A different take on the game was released for the Sega Mega Drive, also known as Indiana Jones and the Last Crusade, in 1992. It is also unrelated to a tie-in NES game by Taito from 1991. Even though basicly same game as the previously released NES version, Master System and Game Gear versions have some different gameplay elements. For some reason Sega ports have no music except the opening jingle, which lasts about 5 seconds. Unlike the NES version, Indy has no recovery time which means enemies can simply walk over him and deplete his health in a second. Whip weapon lasts only 5 swipes and pistol power up is removed. This version also has no boss battles. Look out for cowboys and natives as you look for the Cross of Coronado. Jump over the wagons and reach the locomotive. Search the catacombs beneath the Rome and look for the Shield of the Crusader. Scale the walls of this Nazi infested castle. Fight Nazis and acquire the Grail diary. After that, you must reach bi-plane hangars to escape. Watch out for numerous traps and pitfalls as you look for the Holy Grail. Main article: Indiana Jones and the Last Crusade (8-bit)/Magazine articles. Main article: Indiana Jones and the Last Crusade (8-bit)/Promotional material.